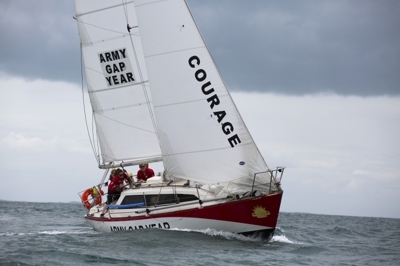 Gun Runner, the second smallest boat in the fleet this year, is owned by the Army Sailing Club. She was raced at the 2017 Sydney Harbour Regatta as part of the ADFSA Inter-Service Yachting Championship, finishing eighth in Non-Spinnaker PHS. The Jarkan 925 also finished PHS seventh overall in the 2017 Land Rover Sydney Gold Coast Yacht Race. Gun Runner exists to promote sailing within the Army and teaches the Army values of courage, initiative, respect and teamwork. This will be her first Sydney Hobart.